7. Discern which fonts to use on a Web page. 8. Check the document for spelling and grammer. 10. Insert a horizontal line. 12. 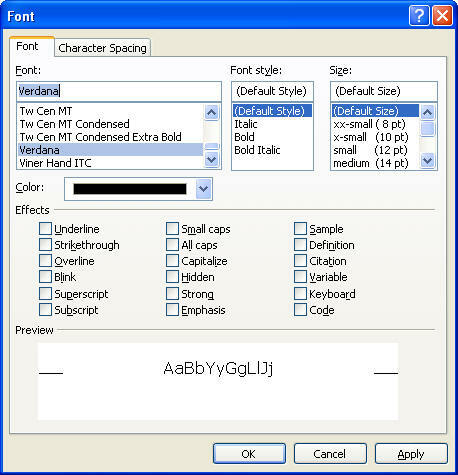 Format text using the Font dialog box. .
1. Restore default toolbars - click task pane on the menu bar, click reset workspace layout. 2. Save a file- click file on menu bar, click save. 4. 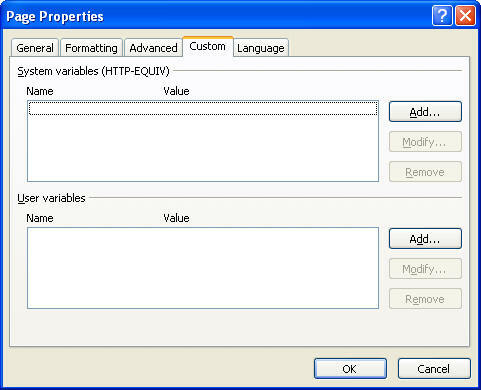 Setting page properties: right click the page, left click page properties. You will see: What you type in the title will be contained between the <title> and </title>, in the page description will be the description meta tag <meta name=description content=" ">, in the page keywords will be keywords meta tab <meta name= keywords content=" "> be sure to include misspellings of key words so that common misspellings will still find your site. 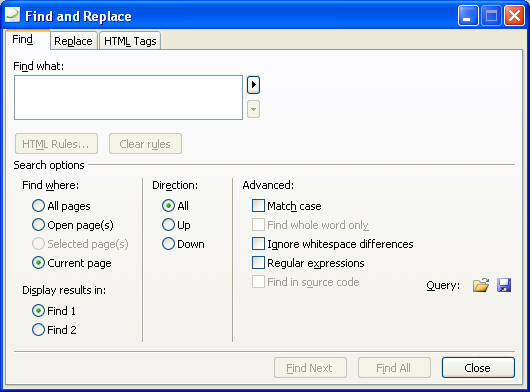 The description and keywords meta tags are read by meta crawlers like goggle. In the general tab you can also add a background sound. B: Formatting Page: Click formatting tab: you will see: Here you can add a background picture, chose the background color, text, and hyperlinks. 1. 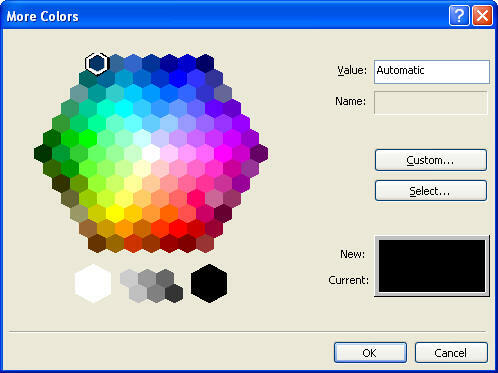 To change back ground color: Click formatting tab, under colors, click background list arrow, click more colors: You will see: Here you can select and blend more than the default colors. C. Advance Properties. 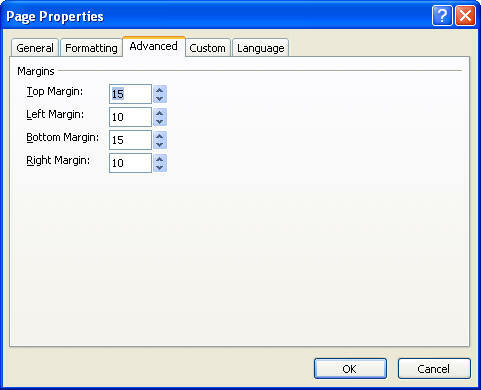 click advance properties tab: you will see: Here you can set the top, left, bottom and right margins of the page. D. Custom Properties - click the custom tab. You will see: Here you can work with system and user variables. 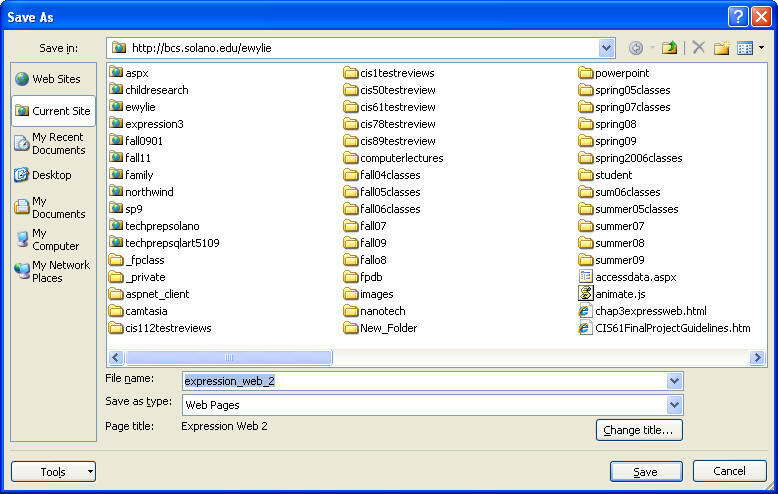 E. Language Properties: Click the language tab. You will see: Here you can select the language that you are working with and the encoding. 5. Code and Design view: Click at the bottom of the page the split tab. In the top pane you will see the code , in the bottom pane you will see the design view. Everything you do in design view will be reflected in code in the code window. Everything you do in the code window will reflect in the design window. 6. Heading, CSS keyword and Point size. a. Font is a particular design given to the appearance of text. b. Font face is a particular type of font. c. Font family is a group of variations on the same font face. b. Select the outside border list arrow from the common menu, then select outside border. You will see an outside border appear around the select text. 9. Colors - are a combination of Red, Green, and Blue There are 216 web safe colors. For 3 number hexadecimal color codes click the following link. 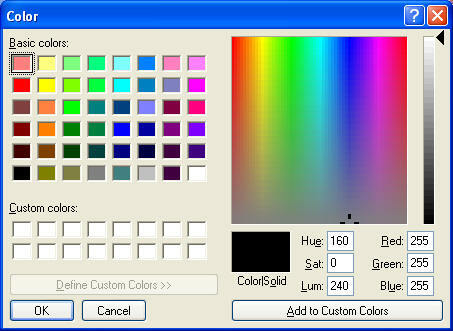 http://html-color-codes.com/ To return to this window click the back button on your browser. 12. 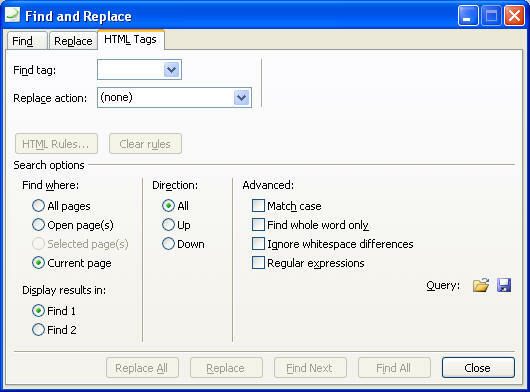 Find and Replace text - Click the find button on the standard toolbar. You will see: Here you can find a word in your document. 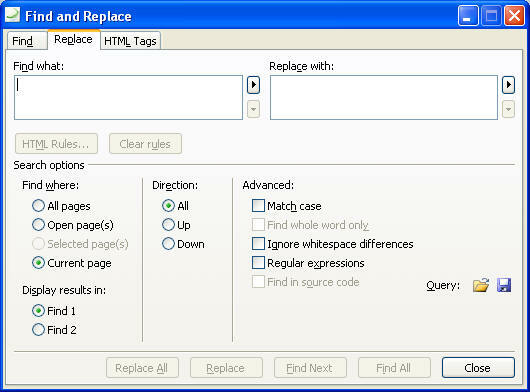 a. Click the replace tap: you will see: Here you can find and replace text in your document. b. Click the HTML tags tab. 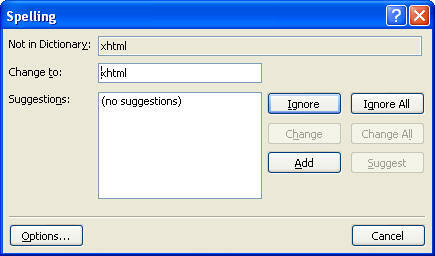 You will see: Here you can find html tags in your document and replace them. 13. To copy and paste - Select the text, right click and click copy or Ctrl-C or cut. Place your cursor where you want to copy the text to, right click and click paste or Ctrl-V.
14. View page in browser - after saving the file, tap the F12 key. a. A bulleted list is started with a dot or some other symbol, also called unordered list can be customized <ul>. d. Definition list is used to format defined terms and their definitions. e. Defined term is the term being explained. f. A nested list is one that is contained within another list. g. Multi Leveled or outline list contains more than one nested list. 16. Create bulleted List: select the text you want. On common toolbar click the bullets button. 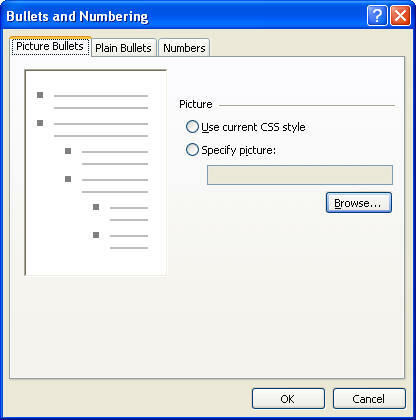 a. Bullets and Numbering, Pictures, here you select pictures for bullets or use CSS. 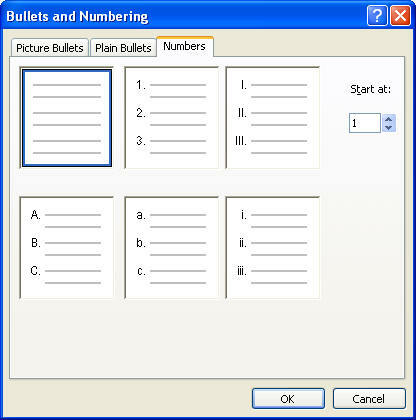 b. Bullets and Numbering, Plain Here you can select the plain bullets. 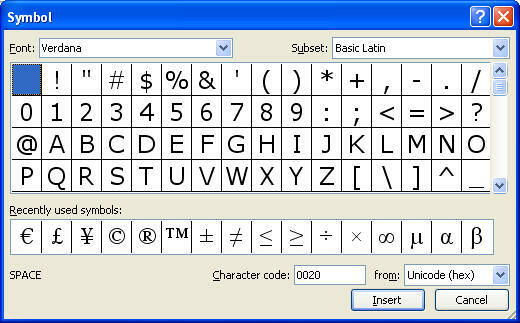 Here you can change the font, style, size, color and effects. 19. The line break tag <br /> just move down one line. 20. Horizontal Line From the toolbox in the upper right hand corner click <hr>. Then double click the horizonal line in design view. 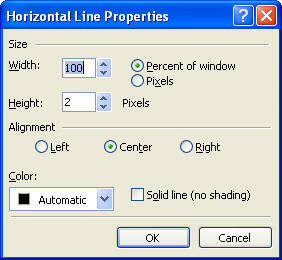 You will see: here you can set the width in percent or pixels, height in pixels, alignment, color and solid line. 21. 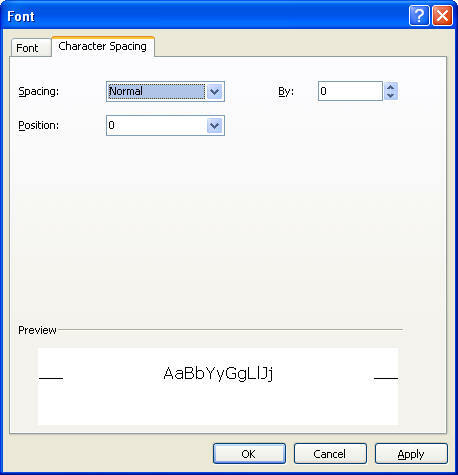 Insert a symbol: Select insert from menu bar, select symbol, you will see: Here you can select symbols from different font families, and subsets.